Our website provides the complete facts to Seattle back and neck pain sufferers about Spinal Decompression Therapy, including clinical trials that support the effectiveness of spinal decompression in treating back and neck pain. We will also tell you the approximate treatment cost so you will be better able to make an informed decision about what you should do for your condition and because our fees are a fraction of what some other clinics charge. If you need any additional information, please call our Seattle office at (206) 324-8600 and ask to speak with Dr. Lincoln Kamell or Dr. Calvin Mulanax at Eastlake Chiropractic and Massage Center. We will talk with you personally in order to help you make the right decision. Spinal decompression therapy is FDA cleared, nonsurgical, drug-free, and has a high success rate for back pain associated with herniated or bulging discs...even after failed surgery. It is a traction based therapy for the relief of back and leg pain or neck and arm pain. During this procedure, by cycling through distraction and relaxation phases and by proper positioning, a herniated spinal disc can be isolated and placed under negative pressure, causing a vacuum effect within it. During spinal decompression therapy, a negative pressure is created within the disc. Because of that negative pressure, herniated disc material that has protruded or herniated can be pulled back within the normal confines of the herniated disc, and permit healing to occur. After a significant amount of research, our office chose the Triton® DTS system manufactured by the Chattanooga Group, the premier manufacturer of physical medicine equipment. We also selected the Triton® DTS systems due to their ability to treat herniated discs in both the neck and the low back. The award winning Triton® spinal decompression table computer is the key. The computer controls the variations in the traction pul,l allowing for spinal decompression and eliminating muscle guarding that is typical in conventional traction devices. The preprogrammed patterns for ramping up and down the amount of axial distraction allows for higher levels of spinal decompression and disc rehydration. Yes! 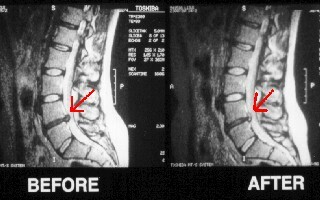 One study documented by MRI up to 90% reduction of disc herniations in 10 of 14 cases and other studies reported that the majority of herniated disc patients achieved "good" to "excellent" results after spinal decompression therapy. Click here if you would like to review the studies yourself. Spinal decompression therapy is not recommended for pregnant women, patients who have severe osteoporosis, severe obesity or severe nerve damage. Spinal surgery with instrumentation (screws, metal plates or "cages") is also contraindicated. 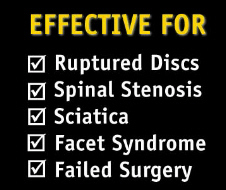 However, spinal decompression therapy after bone fusion or non-fusion surgery, can be performed. In almost all cases, the treatments are completely painless. In fact, some patients fall asleep during the spinal decompression session.The number of sessions needed and your specific treatment plan will be determined by the doctor after your examination. Our customary fee for each spinal decompression session is only $50 which means the total cost will be a small fraction of the $5,000+ amounts that some other doctors are charging. If your insurance company covers spinal decompression therapy, reimbursement varies but your out-of-pocket expense for all needed services could be as little as your co-payment. We want to make it easy for you to learn if you are a candidate for spinal decompression therapy. Just print out any part of this webpage and bring it with you on your first visit. Dr. Kamell will discuss your options with you personally and take the time to answer all the questions you may have about your back or neck. There is NO CHARGE for this consultation!